Most of the time we might end up having a long workbook with huge amount of data and they have lot of worksheets or pages. The top row can be frozen so that it can indicate the title or the column names in every page but unfortunately when we print this lengthy workbook , the top row will not be printed in all the pages except the first one. This can be done by specifying property via the page setup settings. 1. Navigate to the Page Layout Tab in Excel and in the Page Setup group , click the Print Titles button. 2. 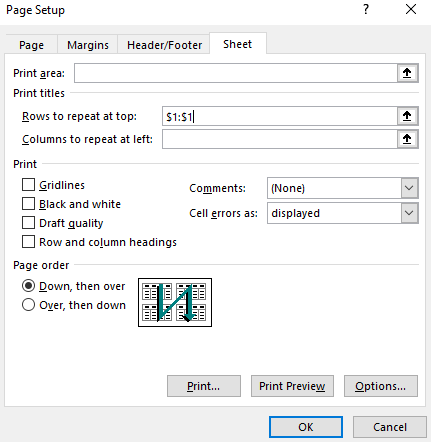 In the Page Setup dialog , click the Sheet tab and then click the browse button to specify the title or top row under the Print Titles (Rows to repeat at top). 3. Click the OK button.Now the title or top row will be printed on every page.